With a scarlet base and 40 beautiful stained-glass effect tissue paper inserts, Firework Red is a 5-tipped hanging paper star lampshade that explodes with dramatic sparkle, vibrancy and colour. Whirling Catherine wheels of rich violet and bright blue fizz against a rich scarlet background, while over 1000 tiny perforations create an alluring twinkle and cast atmospheric patterns of light on walls and ceiling. 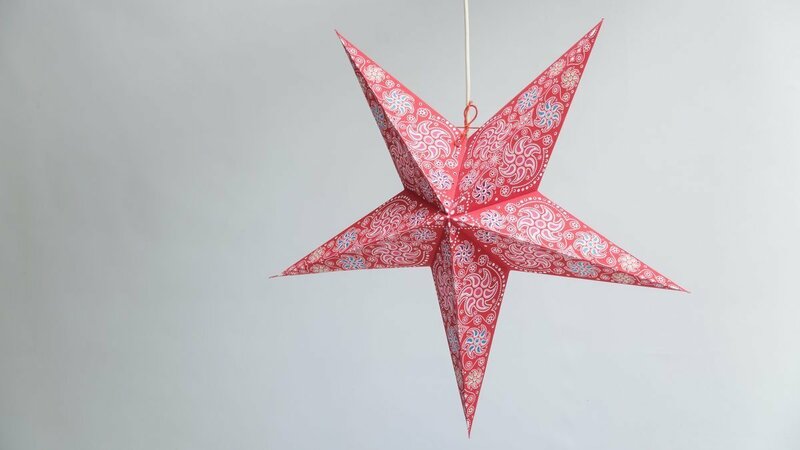 This hand-made and hand-printed paper star lantern is richly decorative and is at home anywhere that welcomes a bold vibrant play of colour. It also looks fantastic displayed in a window for Christmas or Halloween and makes a stunning party light for a festival camp - swap an LED light for an electric bulb if there is no power source. 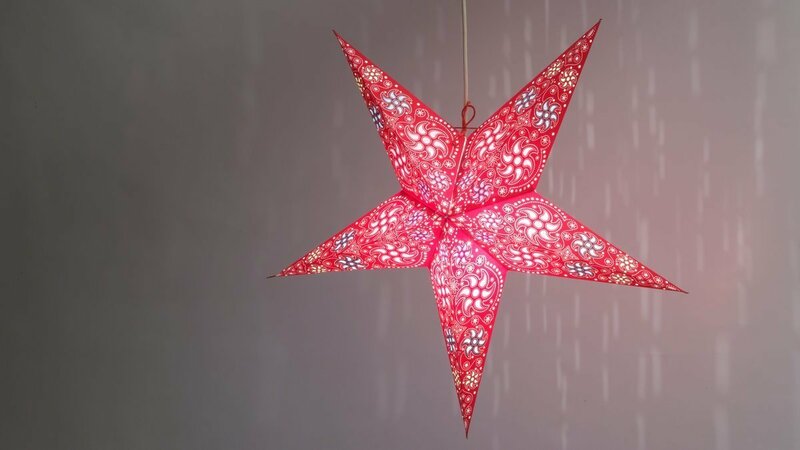 Our paper stars are very easy to assemble, view our page on how to assemble your paper star light shades for an instructional video. Please call us on 01246 554338 or email us on enquiries@starlightlanterns.co.uk to make sure we have enough stock to fulfill your order. Please note: The lanterns do not come with a Light Fitting by default; if you would like to buy one with the Lantern, please add a fitting to your cart with the button below. 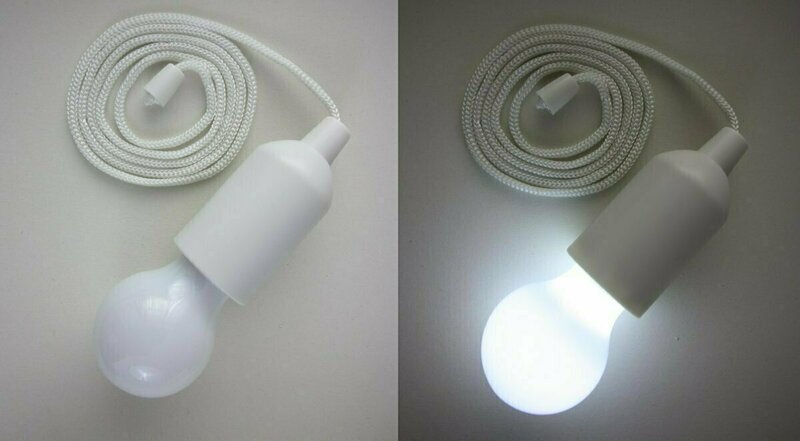 The first lighting solution we offer is an LED Bulb on a Rope which takes 3x AAA batteries to be powered, we also can supply packs of 12 GP Ultra AAA Alkaline batteries, allowing you to light up your stars for as long as possible! 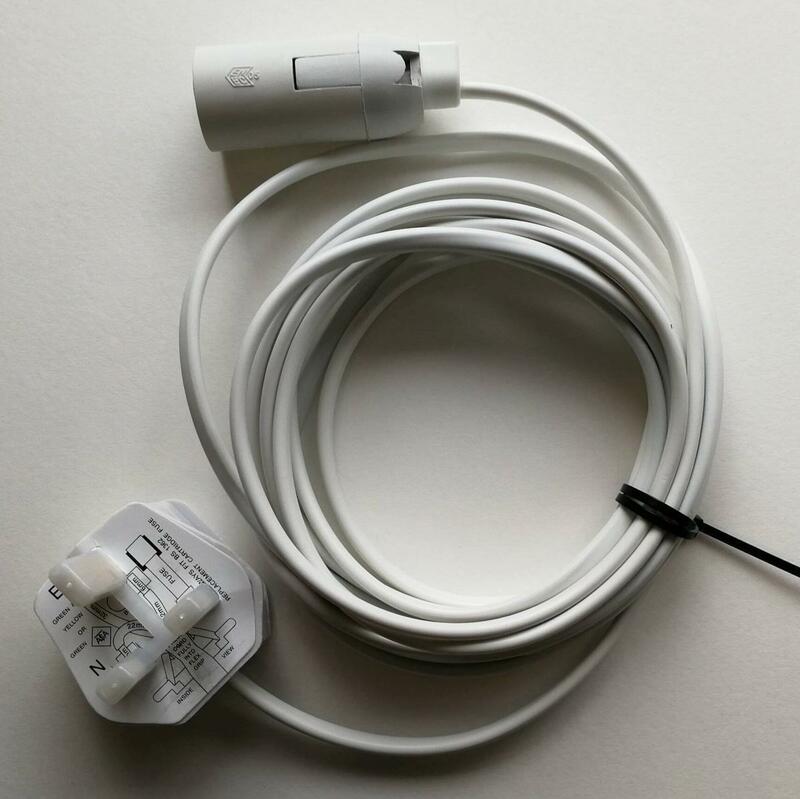 This light fitting is ready made with 4 metres of white cable (long enough to hang your Starlight pretty much anywhere), a 3 pin UK plug on one end, and a Screw Cap (Edison E14) lamp holder on the other. Please note: for indoor use only. View the rest of the Firework paper star range below!